Quick heads up as only a couple more hours to enter the Lotto! 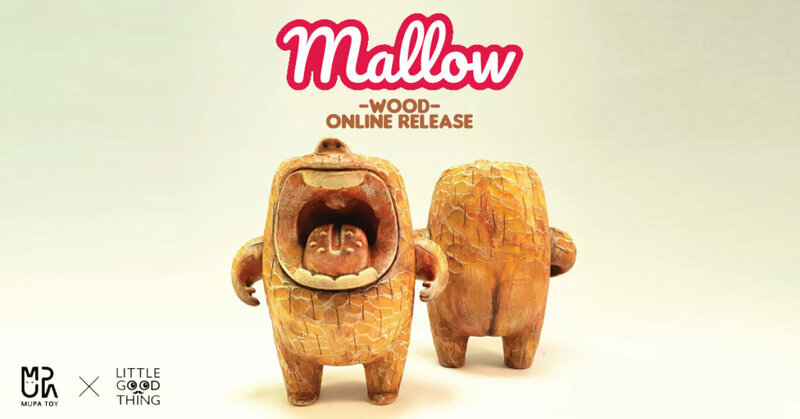 Malaysian artist Ah-b BlowWater AKA Little Good Thing takes over Thailands Muangpaai Ngamsangrat of MUPA TOY’s “MALLOW” which made its debut at BTS 2018. 2 have been saved for an online lotto draw! Like we said previously, back in November 2016 Malaysian artist, Ah-b left us gobsmacked when we thought he carved out Shokona Kazawa’s “Byron” out of wood which you can check out HERE. This led to closer inspection and we found it wasn’t a wood Byron but freaking damn good and fooled us for a moment. Like we’ve said before, we’ve seen many wood style customs but Ah-B wood custom style is more rugged and rustic than we’ve seen but said that that’s the charm about them. Roll on 2018 and his latest victim is the MALLOW again it’s not really carved out of wood, he had us fooled the first time and again this time.